52 n Performance & Hotrod Business n May 2015 HOTROD indoor storage they enjoy while in service can add up to an easier restoration. "I've sold lots of older fire trucks and I've never seen one with more than 50,000 miles," he said. "For example, the engines (in them) are usually serviceable and rarely need rebuilding." Older fire trucks can still require exten- sive mechanical work because their power plants spent hours running large pumps and equipment, rather than racking up road miles. As Okie Allen pointed out, "Older fire truck engines were governed to lower top speeds to keep the rpms down for pumping, but heat and vibration took their toll on mechanical components." Even years ago, city fire departments— such as the Milwaukee Fire Department— had their own shops for building or con- verting fire trucks and servicing them. Today, government regulations require even small fire departments to check the condition of their rigs on a regular basis. Fire trucks are almost always garaged indoors and washed on a regular basis. All of this leads to better-preserved vehicles. This helps make the restoration of fire trucks more profitable for shops, because it's always easier to restore a nice, rust-free vehicle. Specialized Fire Trucks Keith Franz has been collecting very old fire trucks for many years. There are about 19 in his Venerable Fire Collection. "A fire truck is composed of a lot of different types of aptitude requirements for the person who's doing restoration work," Franz noted. "They may have to rebuild an engine, fix a pump or get an old genera- tor running. 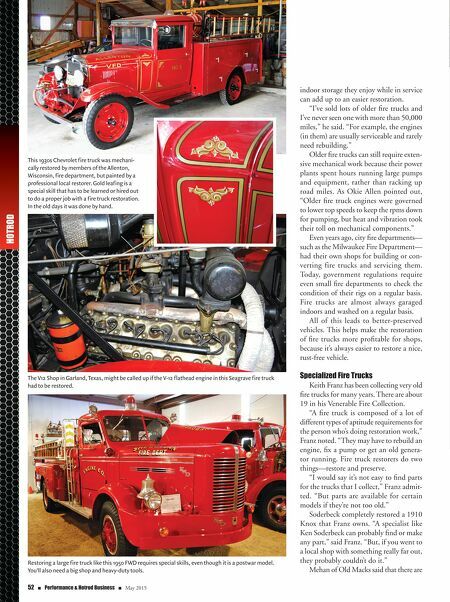 Fire truck restorers do two things—restore and preserve. "I would say it's not easy to find parts for the trucks that I collect," Franz admit- ted. "But parts are available for certain models if they're not too old." Soderbeck completely restored a 1910 Knox that Franz owns. "A specialist like Ken Soderbeck can probably find or make any part," said Franz. "But, if you went to a local shop with something really far out, they probably couldn't do it." Mehan of Old Macks said that there are This 1930s Chevrolet fire truck was mechani- cally restored by members of the Allenton, Wisconsin, fire department, but painted by a professional local restorer. 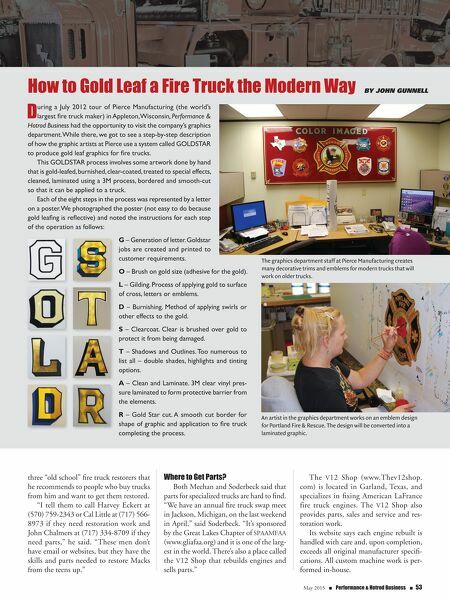 Gold leafing is a special skill that has to be learned or hired out to do a proper job with a fire truck restoration. In the old days it was done by hand. The V12 Shop in Garland, Texas, might be called up if the V-12 flathead engine in this Seagrave fire truck had to be restored. Restoring a large fire truck like this 1950 FWD requires special skills, even though it is a postwar model. You'll also need a big shop and heavy-duty tools.